In general, the Federals had better weapons than those fighting for the southern cause. 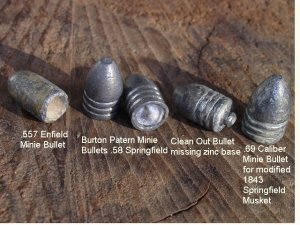 The most common small arms weapon carried by the Federals were rifle-muskets that used 0.69-caliber ball ammunition. The U.S. Army Regulars carried a version of the newly adopted Springfield rifle-musket, Model 1855 or possibly 1861 that fired the 0.58-caliber Minie ball. 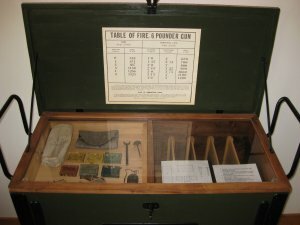 The Federal cavalry used a carbine converted to use percussion caps. The Confederates used a wide variety of small arms, including conversion muskets, hunting rifles, carbines, and shotguns, that greatly complicated the logistics of keeping the troops supplied with ammunition. One unit, Colonel Greer's South Kansas-Texas Mounted Regiment, used the advanced Colt revolving rifle. For artillery, both sides used the smooth bore, Model 1841 6-pounder Guns and 12-pounder Howitzers. Guns were designed to fire solid shot projectiles at high velocity, over low trajectories at targets in the open, although shot and canister were acceptable for use. 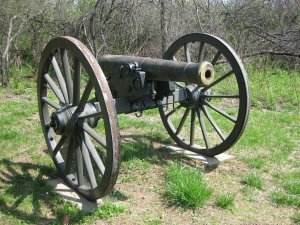 The barrels of the guns were longer than corresponding howitzers, and called for higher powder charges to achieve the desired performance. Howitzers were short-barreled guns that were optimized for firing explosive shells in a high trajectory, but also for spherical case shot and canister, over a shorter range than the guns. 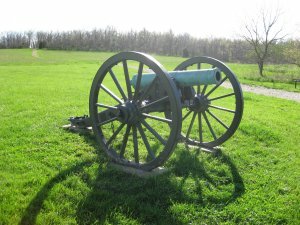 While field use alluded to firing at targets consisting of enemy forces arrayed in the open, howitzers were considered the weapon of choice if the opposing forces were concealed behind terrain features or fortifications. The Federals had eleven 6-pdr Guns and five 12-pdr Howitzers. 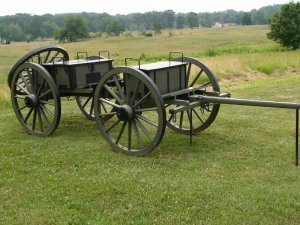 The Confederates had twelve 6-pdr Guns and two 12-pdr Howitzers. The Confederates also had one 12-pound Gun called Old Sacramento" in Bledsoe's Battery. Here's a link to a video that demonstates artillery fire by a gun crew.